In late 2013, the City of Richmond was invited to become a development partner with the International Academy of Sport Science Technology/Académie Internationale des Sciences et Techniques du Sport (AISTS) in Lausanne, Switzerland for the development and implementation of the Sustainable Sport and Event Toolkit (SSET). In 2014, a three year partnership with AISTS was approved to promote the City of Richmond as a leader in sport, sustainability, event management and economic development. A cross-functioning planning team comprised of staff from the City of Richmond and the Richmond Olympic Oval was established to incorporate a Sustainable Sport and Event Toolkit into the Richmond community. In the summer of 2014 the team introduced the AISTS Quick Start Guide to local event planners and organizers for use during the event planning process. After reviewing the feedback provided by event organizers, the team condensed and focused the information provided in the AISTS Quick Start Guide into seven main areas and developed materials tailored specific to community events and environments. These materials were then tested through a group of six events for feedback before major release into the community. The team has established four resources to promote sustainable event management and empower local sport and event organizations to host sustainable community events. 1. Richmond Sustainable Event 7 Step Quick Guide: This simple, two page brochure-style guide is visually attractive and contains seveneasy to follow steps and recommendations nearly all event planners can take to further incorporate sustainability into the event planning process. Further develop the Sustainable Event Champion program as a means to entice community event organizers to commit to sustainable practices. Through the community events which piloted the Quick Guide and Tool Kit, the team found that while event organizers valued sustainability, many did not have the resources available to prioritize their sustainable efforts. 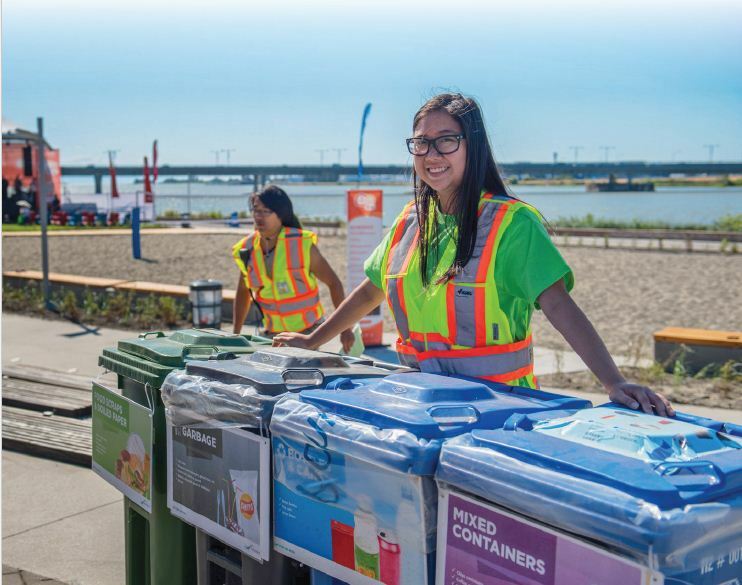 A developed Sustainable Event Champion program with concise criteria, perks, and rewards (such as reduced pricing on recycling and garbage bin fees) may entice community event organizers to make sustainable practices more of a priority during their planning process. Develop a Sustainable Event Leaders program to train volunteers to be knowledgeable in all areas of the 7 Step Quick Guide and Toolkit. This team of volunteers could be contacted by event organizers looking for additional help during the planning process, and could facilitate the implementation of sustainable practices from their knowledge of available resources. This team would not only empower event organizers with the ability to host more sustainable events, but also empower volunteers in the Richmond community to become leaders in sustainability and add further value to current volunteer positions. Determine which sustainable features event organizers will be implementing before the event application is submitted. Integrating sustainable requirements into the application process will alert the event organizer to the importance of hosting a sustainable event and will likely become more of a priority during the planning process if the permit is dependent on sustainable actions. Develop a City of Richmond rental system for resources useful for event planners such as bicycle racks, water stations, fencing, as well as access to volunteers within the City of Richmond database. This rental system would further the City of Richmond’s ability to facilitate a sustainable event planning process, as well as generate revenue which could be used to expand the available resources. While this initiative has made it easier for event organizers who value and prioritize sustainability to take the necessary steps to make their event more sustainable, the real test will be getting commitment from those who do not have the time or resources to take real action. This was evident while testing community events, as the team found that while the event organizers were open to participating and valued sustainable practices, they did not have the dedicated means to act on many of the steps. Furthermore, since the program was voluntary, many of the sustainable recommendations were not prioritized. Two recommendations address this issue: the development of a Sustainable Event Champions program and integrating sustainable requirements into the event application process. Continued development of the Sustainable Event Champion program and a push of sustainable policies enforced by the City will be the keys to success for the City of Richmond Sustainable Event initiative.